rogue poags: #27 ... check! kullen's FIRST birthday was saturday, the 19th, and my coworker [vern] gave him a personal check. She made the check out to him so that i was forced to open him his OWN account and not just deposit it into my account and spend it ;) she knows me SO well!!! so, yesterday i went downstairs to my credit union and opened him his very own kids savings account! 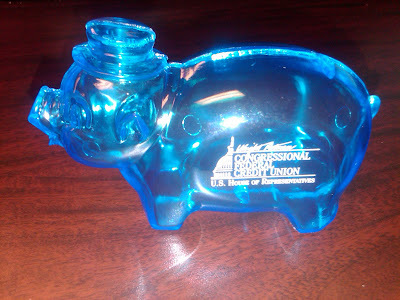 :) they even gave him a little blue piggy bank to commemorate it! I'm following from new friend friday! I hope you'll stop by and follow me too. Stopping by from Monday Mingle. I hope you have a wonderful week!! That's a wonderful plan! Just imagine how much he'll have saved by his college graduation. I will tell you, when they get a little older, they get more and more money from friends and family for special occasions. They realize it, too! We had to at least half it with our son, but I hope you do better than we did! Thanks for joining in on Mingle Monday! Please email me with your mailing address!! !